For the fruit known as the "Chinese bitter orange", see Trifoliate orange. Citrus bigaradia Risso & Poit. Citrus × humilis (Mill.) Poir. Citrus × iyo Yu.Tanaka nom. inval. Citrus × keraji Yu.Tanaka nom. inval. Citrus × sinograndis Yu.Tanaka nom. inval. Citrus × sulcata Yu.Tanaka nom. inval. Citrus × tengu Yu.Tanaka nom. inval. Citrus × aurantium subsp. amara is a spiny evergreen tree native to southern Vietnam, but widely cultivated. It is used as grafting stock for citrus trees, in marmalade, and in liqueur such as triple sec, Grand Marnier and Curaçao. It is also cultivated for the essential oil expressed from the fruit, and for neroli oil and orange flower water, which are distilled from the flowers. Seville orange (or bigarade) is a widely known, particularly tart orange which is now grown throughout the Mediterranean region. It has a thick, dimpled skin, and is prized for making marmalade, being higher in pectin than the sweet orange, and therefore giving a better set and a higher yield. It is also used in compotes and for orange-flavored liqueurs. Once a year, oranges of this variety are collected from trees in Seville and shipped to Britain to be used in marmalade. However, the fruit is rarely consumed locally in Andalusia. Chinotto, from the myrtle-leaved orange tree, C. aurantium var. myrtifolia, is used for the namesake Italian soda beverage. This is sometimes considered a separate species. Daidai, C. aurantium var. daidai, is used in Chinese medicine and Japanese New Year celebrations. The aromatic flowers are added to tea. 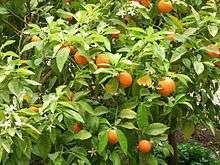 Wild Florida sour orange is found near small streams in generally secluded and wooded parts of Florida and The Bahamas. It was introduced to the area from Spain. Bergamot orange is probably a bitter orange and limetta hybrid; it is cultivated in Italy for the production of bergamot oil, a component of many brands of perfume and tea, especially Earl Grey tea. This orange is used as a rootstock in groves of sweet orange. The fruit and leaves make lather and can be used as soap. The hard white or light yellow wood is used in woodworking and made into baseball bats in Cuba. The unripe fruit, called narthangai, is commonly used in Southern Indian cuisine, especially in Tamil cuisine. It is pickled by cutting it into spirals and stuffing it with salt. The pickle is usually consumed with yoghurt rice thayir sadam. The fresh fruit is also used frequently in pachadis. The juice from the ripe fruit is also used as a marinade for meat in Nicaraguan, Cuban, Dominican and Haitian cooking, as it was in Peruvian Ceviche until the 1960s. The peel can be used in the production of bitters. In Yucatán (Mexico), it is a main ingredient of the cochinita pibil. The Belgian Witbier (white beer) is made from wheat beer spiced with the peel of the bitter orange. The Finnish and Swedish use bitter orange peel in gingerbread (pepparkakor), some Christmas bread and in mämmi. It is also used in the Nordic mulled wine glögg. In Greece and Cyprus, the nerántzi or kitrómilon, respectively, is one of the most prized fruits used for spoon sweets, and the C. aurantium tree (nerantziá or kitromiliá) is a popular ornamental tree. In Albania as well, "nerënxa" or "portokalli i hidhur" is used commonly in spoon sweets. Throughout Iran (commonly known as narenj), the juice is popularly used as a salad dressing, souring agent in stews and pickles or as a marinade. The blossoms are collected fresh to make a prized sweet-smelling aromatic jam ("Bitter orange blossom jam" Morabba Bahar-Narendj), or added to brewing tea. In Turkey, juice of the ripe fruits can be used as salad dressing, especially in Çukurova region. The extract of bitter orange (and bitter orange peel) has been marketed as dietary supplement purported to act as a weight-loss aid and appetite suppressant. Bitter orange contains the tyramine metabolites N-methyltyramine, octopamine and synephrine, substances similar to epinephrine, which act on the α1 adrenergic receptor to constrict blood vessels and increase blood pressure and heart rate. p-Synephrine alone or in combination with caffeine or other substances has been shown to modestly increase weight loss in several low-quality clinical trials. Following bans on the herbal stimulant ephedra in the U.S., Canada, and elsewhere, bitter orange has been substituted into "ephedra-free" herbal weight-loss products by dietary supplement manufacturers. Like most dietary supplement ingredients, bitter orange has not undergone formal safety testing, but it is believed to cause the same spectrum of adverse events as ephedra. Case reports have linked bitter orange supplements to strokes, angina, and ischemic colitis. The U.S. National Center for Complementary and Integrative Health found that "there is currently little evidence that bitter orange is safer to use than ephedra." Bitter orange may have serious drug interactions with drugs such as statins in a similar way to grapefruit. Following an incident in which a healthy young man suffered a myocardial infarction (heart attack) linked to bitter orange, a case study found that dietary supplement manufacturers had replaced ephedra with its analogs from bitter orange. ↑ "Citrus × aurantium L.". Germplasm Resources Information Network. United States Department of Agriculture. 1999-12-17. Retrieved 2010-01-05. ↑ "The Plant List: A Working List of All Plant Species". Retrieved 29 September 2015. ↑ Sharpe PA, Granner ML, Conway JM, Ainsworth BE, Dobre M (December 2006). "Availability of weight-loss supplements: Results of an audit of retail outlets in a southeastern city". Journal of the American Dietetic Association. 106 (12): 2045–51. doi:10.1016/j.jada.2006.09.014. PMID 17126636. 1 2 "Bitter Orange". National Center for Complementary and Integrative Health. April 2008. Retrieved 2008-11-03. ↑ "Dangerous Supplements: Twelve Supplements You Should Avoid". Consumer Reports Magazine. September 2010. ↑ Campaña de recogida de la naranja amarga. sevilla.org. ↑ Apenas se aprovechará la naranja que se recoja en la capital este año. 20minutos.es. ↑ Roger M. Grace. "Cadbury Schweppes Reigns Supreme Over Orange Soda Market". metnews.com. 1 2 3 4 5 C. aurantium. Purdue Horticulture. 1 2 Gange CA, Madias C, Felix-Getzik EM, Weintraub AR, Estes NA (April 2006). "Variant angina associated with bitter orange in a dietary supplement". Mayo Clinic Proceedings. 81 (4): 545–8. doi:10.4065/81.4.545. PMID 16610576. ↑ Bui LT, Nguyen DT, Ambrose PJ (January 2006). "Blood pressure and heart rate effects following a single dose of bitter orange". The Annals of Pharmacotherapy. 40 (1): 53–7. doi:10.1345/aph.1G488. PMID 16317106. ↑ Hess AM, Sullivan DL (March 2005). "Potential for toxicity with use of bitter orange extract and guarana for weight loss". The Annals of pharmacotherapy. 39 (3): 574–5. doi:10.1345/aph.1E249. PMID 15657116. ↑ Stohs SJ, Preuss HG, Shara M (August 2012). "A review of the human clinical studies involving Citrus aurantium (bitter orange) extract and its primary protoalkaloid p-synephrine.". Int J Med Sci. 9 (7): 527–538. doi:10.7150/ijms.4446. PMC 3444973 . PMID 22991491. ↑ Duenwald, Mary (2005-10-11). "Bitter Orange Under Scrutiny as New Ephedra". New York Times. Retrieved 2008-11-03. ↑ Jordan S, Murty M, Pilon K (October 2004). "Products containing bitter orange or synephrine: suspected cardiovascular adverse reactions" (pdf). Canadian Medical Association Journal. 171 (8): 993–4. PMID 15497209. ↑ Bouchard NC, Howland MA, Greller HA, Hoffman RS, Nelson LS (April 2005). "Ischemic stroke associated with use of an ephedra-free dietary supplement containing synephrine". Mayo Clinic Proceedings. 80 (4): 541–5. doi:10.4065/80.4.541. PMID 15819293. ↑ Holmes RO, Tavee J (July 2008). "Vasospasm and stroke attributable to ephedra-free xenadrine: case report". Military Medicine. 173 (7): 708–10. PMID 18700609. ↑ Sultan S, Spector J, Mitchell RM (December 2006). "Ischemic colitis associated with use of a bitter orange-containing dietary weight-loss supplement". Mayo Clinic Proceedings. 81 (12): 1630–1. doi:10.4065/81.12.1630. PMID 17165643. ↑ Thomas JE, Munir JA, McIntyre PZ, Ferguson MA (2009). "STEMI in a 24-Year-Old Man after Use of a Synephrine-Containing Dietary Supplement: A Case Report and Review of the Literature". Tex Heart Inst J. 36 (6): 586–90. PMC 2801940 . PMID 20069086. Wikimedia Commons has media related to Citrus aurantium.